CHARLOTTE, NC (Bruce Henderson/The Charlotte Observer) - Mecklenburg County has joined a growing number of North Carolina jails that have ended in-person visits, a move that has drawn criticism because inmates can only talk to family members by video. Studies show that inmates who have visitors are less likely to return after their release. But inmate advocates, and the correction industry's trade association, say video should be deployed in addition to personal visits – not replace them. Instead, many county jails including Mecklenburg's end in-person visits altogether once they install video systems. The Mecklenburg County Sheriff's Office cites safety and staffing benefits. Detention officers no longer have to move inmates to meet visitors because video stations are installed in each jail housing unit. They also don't have to worry about visitors slipping in contraband. The county's video technology, installed a year ago, also allows more flexibility in visitation times. For a fee, visitors can remotely visit inmates from anywhere or buy extra visiting time. Inmates and their families, however, say video technology is often glitchy. Digital connections are sometimes spotty, they say, producing dark images and poor audio. And it can be challenging to hold conversations in noisy jail pods. Because the video visits are recorded, said Mecklenburg County Public Defender Kevin Tully, inmates are less likely to discuss their legal options with their families, who they may trust more than lawyers. (Attorneys may still meet face-to-face with clients.) In-person visits were not recorded, although telephone calls from inmates are. "One of the real problems we have with the court system is the systematic dehumanization of people," Tully said. "If we're going to make improvements, we have to go in the direction of humanizing people in the system. And this is a giant step in the wrong direction." The American Correctional Association, which accredits Mecklenburg County's jails, last year adopted a family-friendly visitation policy. The policy says correctional agencies should promote use of "emerging technologies as supplements to existing in-person visitation." The ACA didn't respond to Observer questions. Mecklenburg inmates get one free 25-minute virtual visit – they previously got 30 minutes a week of in-person visits – but can buy additional remote visits at $12.50 for 25 minutes. Inmates can get video visits any day of the week, instead of the single fixed day for personal visits. Nationally, companies that install digital communications technology in detention facilities are attracting both revenues and criticism. The Prison Policy Initiative, a prison-reform advocacy group, says the companies exploit a captive clientele despite frequent complaints about low-quality video and sound. The group's 2015 review of the estimated 500 detention facilities using video visits – it counted seven in North Carolina – found that the technology is more commonly used in local jails, which typically abolish in-person visits, than in state prisons. Irena Como, staff attorney with the American Civil Liberties Union of North Carolina, notes that the families of most county jail inmates live nearby, reducing the usefulness of long-distance visits by computer. "Video visitation is just not an adequate substitute for in-person visits because you can't make direct eye contact," Como said. "If the goal is to help these people maintain their ties to the community and professional networks so they can improve themselves, they need personal visitation." In a letter this month to the Observer, Mecklenburg County jail inmate Elijah Kelly wrote that the video visitation system leaves "a lot to be desired." "Picture and sound are very quirky and jail personnel seemingly have a take-it-or-leave it attitude," wrote Kelly, 65, who is charged with arson and is in jail awaiting trial. Most detention officers, he added, don't know how to fix technical issues. Another problem, Kelly wrote, is that the placement of video monitors was "not well thought out," so he sometimes has to do his visits next to a television – or beside inmates who are talking loudly and yelling. During her 21 years in federal prison, Charlotte resident Ramona Brant recalled, "the only thing you had to look forward to was to look into the eyes of your parent, look in the eyes of your child." Former President Barack Obama granted Brant clemency last year. With the help of Changed Choices, a Charlotte non-profit that supports women during incarceration and after their release, she now works for the city but continues to speak up for imprisoned women. Brant calls visits by video "dehumanizing." When she recently tried to sign up to visit her son in the Mecklenburg County jail, Brant found the system so complicated that she gave up. Mecklenburg County contracted for its video system with Reston, Virginia-based GTL, a company whose website says it serves 2,300 correctional facilities in all 50 states. North Carolina's prison system also contracts with GTL to let visitors buy phone time with inmates, according to the Department of Public Safety website, but does not offer video visits. GTL paid the installation costs of Mecklenburg County's $1.7 million system. In turn, GTL keeps revenues from remote visits with inmates. GTL won't comment on revenues it earns from the Mecklenburg system, but offered each inmate a free remote video visit over this Thanksgiving weekend. The five-year contract the county signed with GTL in 2014 requires the sheriff's office to use GTL's scheduling system for all inmate visits. The contract also limits free visits to 30 minutes a week. GTL has called video visitation "an effective complement to traditional visitation methods – not one meant to replace them." "Some in our industry have (sic) pushing for the elimination of in-person visitation when facilities implement remote video visitation, but GTL recommends providing a spectrum of options rather than dictating the terms of visitation in any specific facility," says a blog post on the company's website. Asked why the Mecklenburg jails don't offer both personal and video visits, the sheriff's office says moving large numbers of inmates to meet visitors was labor intensive. "Direct supervision" facilities like Mecklenburg's two jails, which cluster cells around living areas, are designed to provide as many services to inmates inside their housing units as possible. "The GTL technology provides (the Sheriff's Office) with modern visitation advancements which improves safety and security measures and currently fosters additional visitation opportunities and conveniences for our customers," said spokeswoman Anjanette Flowers Grube. One inmate was able to visit his newborn child and its mother by video while they were still in the hospital, she said. For free visits, guests use video stations on the second floor of the Work Release and Restitution Center on Elizabeth Avenue. Stations are positioned three to a row, each with a pair of low stools, a monitor and two handsets. Carolyn Lowe, who lives outside Mecklenburg County, visited by remote video while her daughter was in the Mecklenburg jail last summer and, more recently, in a federal facility in Oklahoma. "It worked out good for us," Lowe said. "There's absolutely no way we could have gone to Oklahoma." Regular visits are important for both her daughter and her family, Lowe said, in part because they let her 9-year-old grandson stay in touch with his mom. "She wasn't comfortable, other times she's been in trouble, with us bringing him to see her in jail," she said. Lincoln County says its video-only inmate visits, in use for about five years, have made its jail safer because inmates don't have to be moved to visitation areas. As in Lowe's case, the ability to communicate by home computer also makes visits with inmates less disturbing to children, the jail administrator said. "The families and the inmates would rather have face-to-face visits, but our main reason has been for safety and for security," said Lt. Alan Houser. "Anytime you have to move an inmate from a secure environment to another location, anything can happen during that move." Wake County, like Mecklenburg, allows personal visits only between inmates and attorneys or other professionals. 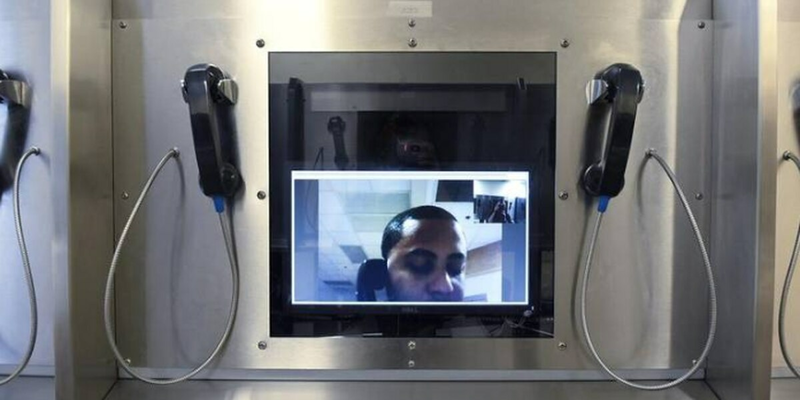 But when Durham County launched video visitation in October, it was in addition to in-person visits, giving inmates "another way to connect with their families," Sheriff Mike Andrews said in a statement. Inmates still get two in-person visits a week, as before, but can now get a third visit by video. Durham County contracted with GTL, Mecklenburg's contractor, in hopes that video visits would cut down on the thousands of personal visits that sometimes ran late into the night, said Col. Anthony Prignano, the county's detention services director. Prignano believes Durham is the first North Carolina county to offer both personal and video visits. "The public's perception is that we're getting rid of face-to-face contact," he said, referring to advocates' complaints. "What we're trying to get out is that we're trying to supplement that with video visitation." During a recent visit to Mecklenburg's video center, the screens' image quality was clear but similar to Skype. Sound was also clear but with an electronic tinniness. Grube acknowledged some initial "system glitches" that she said GTL has worked to resolve. But Matthews resident Angie Forde, 67, a volunteer for the Red Boot Way, which works for "compassionate communities," said she's heard more than a half-dozen of the female inmates she visits at Jail North complain about the video technology. Inmates tell her the video screens are too dark to distinguish facial features and static makes it hard to hold conversations. Many inmates can't afford to pay for remote visits, Forde added. Some say the system seemed like an added punishment. In September, Forde said she visited an inmate who was in tears because she hadn't been able to see her toddler for six months. "There's no way that catching a glimpse of a child walking by on a video screen is going to give that mother what she needs," she said.